Dear Diary, it's Vlad again. It feels good to still write in you daily. After two centuries in Forgotten Hollow these entries help keep my memory fresh - and a vampire has to have sharp wits to live this long! I woke up rather early today, around 4:30 pm. I've always been an early riser. I like to be up and out of the coffin early enough to watch those last awful rays of sunlight die over the mountains. I made quick work of a plasma pack to help satisfy my thirst, as an early breakfast. 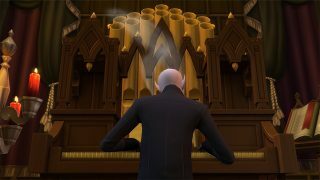 By sunset I started on my daily routine, beginning with some haunting melodies on the pipe organ. I must say, I've gotten pretty good after all these years. As soon as those last pesky rays of sun had gone, I went out to walk the grounds of my estate. My mist form concealed me nicely as I drifted through the headstones in the cemetery. The fog rises quite nicely at night, and it further concealed my movements. This is my favorite time of night. The soft purple glow of the plasma fruit trees, the Sixam mosquito trap plants making a delightful crunch noise as they pick bugs out of the air. But then I heard all the nightlife picking up down in the town center, and realized I was feeling pretty thirsty again. I headed down the hill to the town center a little after 8 pm. I'm no narcissist, but I really do love to gaze at my statue prominently displayed at the center of it all. The Sims in this town think the statue is the of my Great Grandfather, Vladislaus Straud the First. The local vampires know the truth though; I founded this town and I still run it. As I was sitting there admiring that handsome statue, I spotted what I was looking for: two oblivious Sims heading off towards the waterfall for a little late night stroll. I quickly vanished into the mist and reappeared right by them, calling upon my dark powers to quickly mesmerize the gentleman, while compelling his friend to allow me a drink. There is nothing like FRESH plasma! Alas, my pleasant meal was interrupted by those annoying Vatore siblings, Caleb and Lilith. They just showed up, dispelled my mesmerized Sims, and started lecturing me about alternatives options to the traditional methods of thirst quenching. And as if that wasn't bad enough, they followed by starting in on my wardrobe choices, personal hygiene, and showing my dark form in public. I don't know what they have against grey coats. I have a hundred of them, they go with everything and always stay in style. Trust me, I should know. Anyway, I digress. The point is, they were ruining my night and it was time to put them in their place. We agreed to a showdown like the good old days. At high moon, we would meet in front of my estate for some not-so friendly vampire sparring. We clashed in the air and we clashed on the ground, and as predicted I was the victor every time. When Caleb had had enough he finally hung his head in shame and marched back down the hill to his home. If he wants to best me in one of my epic duels he better start carrying garlic. At this time, it started getting early, and the sun was coming up, so I spent some time in dark meditation to re-energize myself and read through the last few chapters of the Encyclopedia Vampirica (which I highly recommend, as it's very informative AND interesting). Not to mention, most of it is about me. As the sun rose, I descended into my crypt and found just enough time to finish this entry before I close the lid on this coffin and settle in for some deep undead rest. 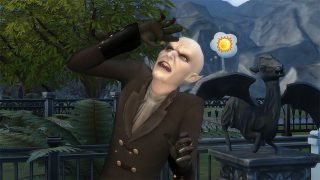 Excited for your Sim to meet Vlad for the first time? 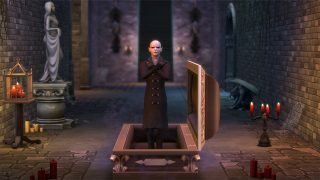 Let us know all about it on Twitter, Facebook, Tumblr and Instagram using #TS4Vampires!